Surgery was a success and I'm finally home. I had a really rought time in recovery - the pain was unbelievable and feeling subhuman for the last two weeks has been hard, but since I can finally type for a few minutes I think I'm on the road to recovery. Mostly my day consists of waiting for rounds of pills to stave off pain whilst trying to force my slow and uncooperative body around in the walker. I haven't washed my hair in any real way since Aug. 16th so I feel like an orc or something. Tomorrow I maybe be able to sit in a shower chair and get a limited shower and actually shampoo my hair so I'll feel way better then. My dream is to get into a deep bath full of bubbles and soothe my pains away, but that is about a month off I think. I'm ETERNALLY grateful to my family for taking care of me - I never ever would have made it without them. My docs were great and my nurses were a rather mixed bag, but enough good ones to make me grateful to them, too. Physio therapists are by definition tought gym teachers and mostly I'm happy with them, but the occupational therapist seemeed intent on treating me like my surgery was brain surgery or something and after awhile of being treated like an idiot and being in a lot of pain and repeating myself I got a little short with her so I'm quite glad to see the back of her. All in all, though, not a bad experience. Still, my GREATEST piece of advice for a stay at the hospital is have someone with you at all times that questions what's going on and if the right med/therapy/appt./etc. is going on because the hospital is just FULL of mistakes and you could be harmed without an advocate fighting at your side constantly. That's all I can stand to type for now before I crash and fall asleep again. Thanks to All you great bloggers and friends out there for your kind wishes. I hope to be blogging fun crafty/artsy stuff again very soon. Happy Sunday!!! Tomorrow I go in to the hospital for a central line and then Monday is my surgery so I'll be gone from blogland until I've recuperated a bit. Thank to everyone for their wishes and prayers. I would be lying if I said I wasn't scared, but then I think any sane person on this earth would be scared so no apologies for that. Just fyi to anyone curious or out of the loop. I have been living with rather severe scoliosis since I was diagnosed at 11. I wore big ugly, painful brace for a year and then had to have surgery the next year. I have three rods in my back along with lots of ugly bolts and screws and it did me well for about 16 years, but now the pain is back with a vengeance and I can hardly walk or do much of anything so I finally dragged myself back to see the doctor and found out my back has degenerated quite badly and part of one rod is broken and I need to extend more rods to hold my whole back in place and all sorts of other disturbing details that I wish I didn't know about so enough said about that. I'll be in the hospital at least a week, possibly more and then recuperating for months afterward. 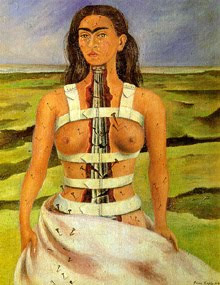 I have an EXCELLENT surgeon so I'm not too worried about the results. If you would like more information you can visit my surgeon's website. The adult scoliosis link lets you see all types of x-rays of the kind of surgery I'll be having. I do warn the squeamish, though, that they are disturbing to most people so view with caution. My next post will be the 100th and I'll be sure to have a giveaway when I'm feeling better. I've been working on some pretty cool necklaces and jewelry which I'll save for a surprise. :) See ya guys later!! 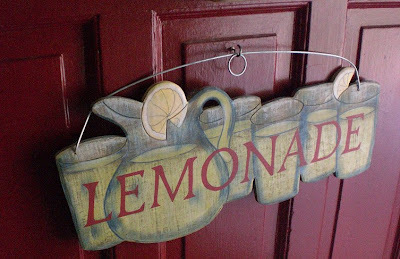 I got it at Hobby Lobby a few years ago. 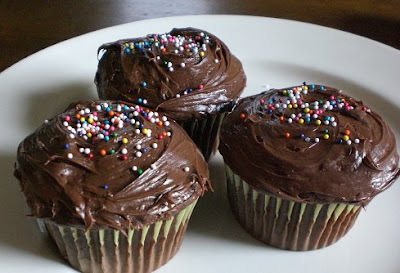 And I'm craving chocolate cupcakes right now...mmmmm....have one! Yesterday after I got home from the pool I spotted some prowlers across the street!! Our neighbor's chickens got loose!! Yikes. No one was home so we had to hurry up and herd them back into their own yard before they got hurt. Aren't they beautiful to look at? Such vibrant colors. I saw the neighborhood cat run away from its hiding place nearby once we started herding them back in - they're lucky we saw them first! You just don't see this kind of thing every day in the city it was really fun. 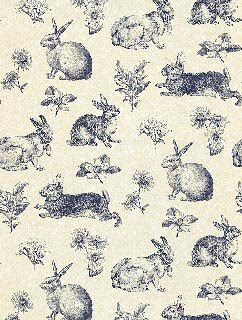 Have you seen this rabbit toile wallpaper?? I've been searching for it high and low ever since we first spotted this on some wallpaper site and failed to buy it. I'm not really big on wallpaper actually up on my walls as I figure I'll get tired of it or find it too repetitive. What I'd really like is to paper a room with vintage sheetmusic or old maps or find some wallpaper that looks like elegant old handwriting all over the walls. I've yet to find a decent example of that, though. Sometimes I'm tempted to paper a wall with all the beautiful scrapbooking papers I have. Why do those seem prettier than anything I can find at a wallpaper store?? Anybody got a really cool wallpaper picture or link to share? ?